As we follow God’s leading to Providence and beyond we clearly see our limitations and ask for your help. 1. Prayer Support: It is our hope to participate in the supernatural work of God expanding his kingdom through his church. Apart from him this cannot happen. Please consider praying for God’s work in Worcester. Via our monthly updates and quarterly newsletters we will keep you informed on the ups, downs, and power of God at work to build his church. Click here to sign up for our updates. 2. 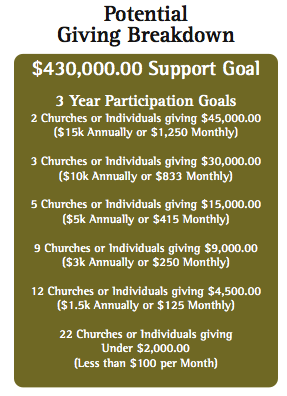 Financial Support: By its nature, the work of beginning a new church requires external funding. This is especially true in New England where the cost of living is high and the giving culture weak. Thus the journey towards a self-sustaining church is slow, arduous work. Working with the leadership of Trinity and other wise contributors we have established a external funding goal of $500,000º. This goal is designed to provide for the establishment and growth of a self-sustaining church over a five year time period. Trinity will be contributing $70,000 towards the total so that Jarrett will need to raise $430,000. Jarrett will raise this over the course of three years and below you’ll see a potential breakdown as to how we seek to meet this $430,000 goal. 3. Connections: Do you know people in Worcester and the surrounding area who would be interested in our work? Are there friends in other parts of the country who have a passion for the advance of God’s kingdom in New England? God continues to connect us with a variety of people and resources that have helped and guided us. If there is some you’d like to connect us to, we would be deeply appreciative. ºThis figure of $430,000 is our best projection which we are seeking to refine as we move forward. *All gifts are tax deductible and filter through Mission to North America (MNA) an agency of our denomination. MNA provides accounting services and financial accountability, all free of charge, so that all monies given will go to our church planting efforts.